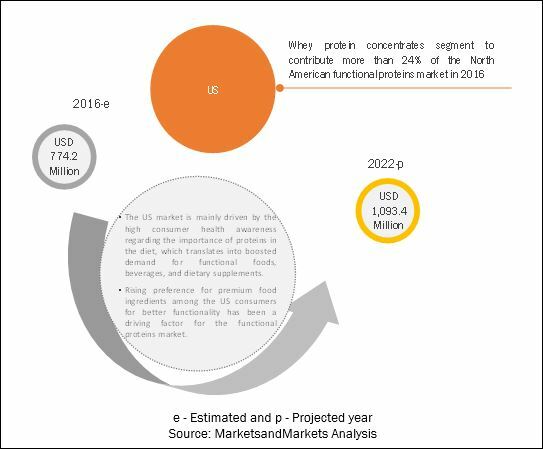 [156 pages report] The functional proteins market was valued at USD 4.17 billion in 2017 and is projected to grow at a CAGR of 6.6% from 2017, to reach a value of USD 5.74 billion by 2022. 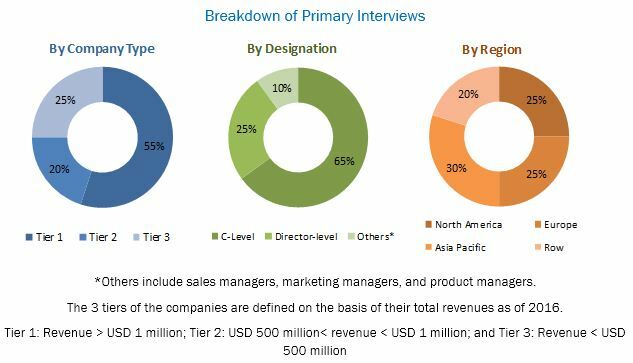 The basic objective of the report is to define, segment, and project the global market size of the functional proteins market on the basis of type, application, source, form, and region. 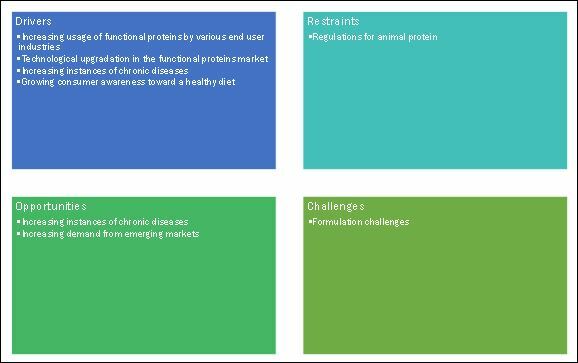 It will also help to understand the structure of the functional protein market by identifying its various segments. The other objectives include analyzing the opportunities in the market for the stakeholders, providing the competitive landscape of the market trends, and projecting the size of the functional proteins market and its submarkets in terms of value (USD Million) and volume (KT). This research study involved extensive use of secondary sources, which included directories and databases, such as Hoovers, Forbes, Bloomberg Businessweek, and Factiva, to identify and collect information useful for a technical, market-oriented, and commercial study of the functional proteins market. The primary sources that have been involved include industry experts from the core and related industries and preferred suppliers, dealers, manufacturers, alliances, standards & certification organizations from companies; and organizations related to all the segments of this industry’s value chain. In-depth interviews have been conducted with various primary respondents such as key industry participants, subject matter experts, C-level executives of key market players, and industry consultants to obtain and verify critical qualitative and quantitative information as well as to assess future prospects. The following figure depicts the market research methodology applied in drafting this report on the functional proteins market. 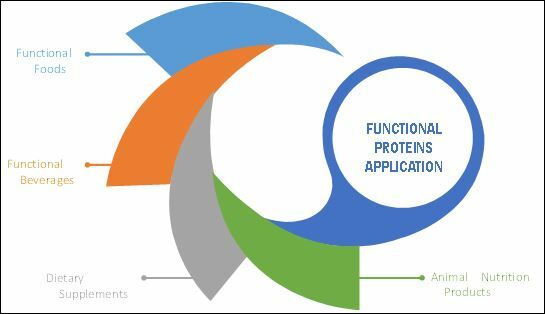 Key participants in the functional proteins market are the functional protein manufacturers, suppliers, and regulatory bodies. The key players that are profiled in the report include Archer Daniels Midland Company (US), Koninklijke DSM N.V. (Netherlands), Cargill (US), BASF (Germany), Ingredion (US), Roquette Frères (France), SunOpta (Canada), Darling Ingredients. (US), Omega Protein Corporation (US), DowDuPont (US), Kemin Industries, Inc. (US), InVivo (France), and John Pointon & Sons Ltd. (UK). Functional proteins are used in various applications such as dietary supplements and food & beverages due to the rising demand for food products with improved functionalities. The ability of functional protein manufacturers to develop distinct isolates, concentrates, and other forms of protein ingredients for different food products, such as dairy products, beverages, dietary supplements, infant formula, bakery products, and confectionery products, is expected to drive the growth of the functional proteins market during the forecast period. The global functional proteins market is projected to reach USD 5.70 billion by 2022, at a CAGR of 6.6% from 2017. The growth of the functional proteins market is driven by consumer awareness about a healthy diet, increasing instances of chronic diseases, and technological upgradation in the functional proteins market. The key drivers for the market are the shift in demand from processed to healthy and functional food. The US-FDA (US Food & Drug Administration) has strict regulations regarding proteins sourced from mammalian tissues. For instance, the Ministry of Agriculture and Forestry (MAF) of New Zealand prohibits the feeding of ruminant protein in any form, composition, or admixture to ruminants due to the risk of spreading Bovine Spongiform Encephalopathy (BSE), also known as mad cow disease. As a result, the restriction has had an adverse effect on the supply of protein ingredients sourced from animals worldwide as it restricts the trade and availability of certain animal-based proteins meant for human consumption. Whey protein is one of the major ingredients for manufacturing several milk-based products and is used by many food & beverage manufacturers as a protein source for product innovation. The major whey proteins are á-lactalbumin and â-lactoglobulin, which find significant demand from the processed food & beverage industry. The production of whey protein concentrates (WPCs) involves the processing of fluid whey through ultrafiltration to produce a variety of WPCs. WPCs are commonly used as a source of protein in functional food & beverages owing to their easy availability or ease of production and low cost as compared to hydrolysates and isolates. WPCs have several functionalities in the food & beverage industry. For instance, they are used as water binding agents, enabling viscosity, as an emulsifier, foaming agent, and also as a flavoring agent in food & beverages. Leading functional protein manufacturers are developing sustainable and innovative solutions for existing and new applications to drive the industry forward. Functional food is conventional food that is consumed as part of the diet, which along with nutrition, provides various health benefits. Protein is added to functional food products to offer health benefits such as curbing the appetite in order to help toward weight management. Due to this, there is a rising trend for healthier snacks such as protein-based bars among consumers. Companies are developing functional proteins such as protein hydrolysates for infant food for children with an allergy to cow’s milk (CMP/CMPA). The most common protein hydrolysates seen in infant formula are casein and whey proteins hydrolysate. Food products containing functional proteins for sports nutrition include protein powders, protein bars, and ready-to-drink (RTD) protein products. Whey protein is one of the primary ingredients used in various sports nutrition products due to fast absorption and relatively low cost. Isolate is a premium functional protein type due to the less fat and carbohydrates content. Further, companies are offering various functional beverage products such as whey-juice drinks, soy-juice drinks, and protein shakes, which are excellent alternatives to conventional beverages and are preferable sources of protein. There is a rising trend of companies offering functional beverages fortified with whey protein isolates, which contain low fat and lactose. This whey protein isolate improves the functional attributes of different beverages such as juices. Dietary supplements come in the form of capsules, liquids, powders, or tablets and are consumed to balance the deficiencies of certain nutrient components in diets. In dietary supplements, one of the upcoming trends is the intake of protein powder, which promotes muscle gain, fat loss, and provides nutritional benefits. There is a growing consumption of different types of functional proteins, of which whey protein is a popular diet supplement among consumers of all ages. Weight-loss supplements that include whey powder as an appetite suppressor is also witnessing an increasing trend of consumption. The market for feed ingredients such as protein is expected to experience significant growth in the future as feed manufacturers tend to attain more output from animals due to which various nutritious ingredients are used in feed. The use of functional proteins that offer physiological and microbiological benefits to the digestive systems of livestock & companion animals is becoming more prevalent across the modern feed and pet care industries. Various ingredient manufacturers offer a range of ingredients, such as protein for animal nutrition applications. Pea protein, whether concentrate or isolate, is used in feed such as pet food for nutritional fortification. The functional protein industry is going through the demand-supply gap; when will this scenario ease out? What will be the prominent revenue generation pockets for the market in the next five years? Most of the suppliers have opted for expansion & acquisition as the key strategies as observed from the recent developments. Where will it take the industry in the mid to long term? 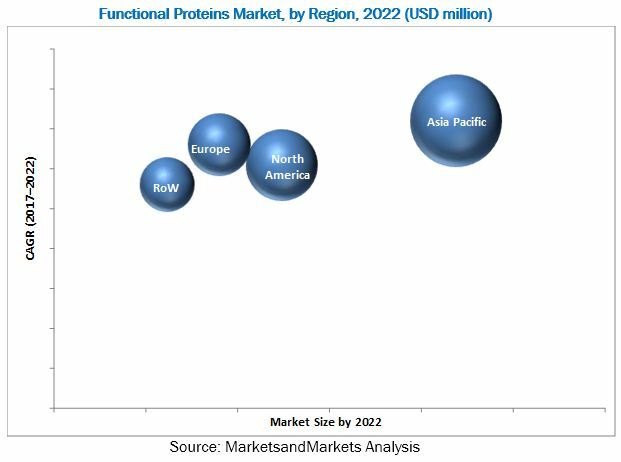 The functional proteins market was valued at USD 4.17 billion in 2017 and is projected to grow at a CAGR of 6.6% to reach a value of 5.74 billion by 2022. The increasing pet population and pet adoption trends to improve the palatability of pet food are some of the key trends influencing the growth of the functional proteins market. Based on type, the market has been segmented into hydrolysates, whey protein concentrates, whey protein isolates, casein & caseinates, soy protein, and others. The whey protein concentrates segment dominated the market in 2017. Whey protein is one of the major ingredients used for manufacturing several milk-based products and is used by many food & beverage manufacturers as a protein source for product innovation. They are commonly used as a source of protein in functional food & beverages, owing to their easy availability or ease of production and less cost, as compared to hydrolysates and isolates. In terms of application, the dietary supplements segment, the market has been segmented into functional foods, functional beverages, dietary supplements and animal nutrition Dietary supplements come in the form of capsules, liquids, powders, or tablets and are consumed to make up for the deficiencies of certain nutrient components in diets. In dietary supplements, one of the upcoming trends is the intake of nutritional supplements such as protein powder; which promotes muscle gain, fat loss, and also provides nutritional benefits. There is a growing consumption of different types of functional dietary protein supplements among consumers of all ages. Based on source, the animal segment accounted for the largest share of the global functional proteins market in 2017. The demand for animal protein is driven by its better nutritional and flavor profile compared to plant-derived proteins. Further, the increasing use of animal protein in end-use applications, such as sports nutrition and the limited availability of substitutes for egg and gelatin in various food products—which, in turn, is influenced by lifestyles and demographic shifts—are the key market drivers. Asia Pacific is projected to be the fastest-growing market for functional proteins during the forecast period. The consumption of plant-sourced proteins such as soy protein and pea protein in the Asia Pacific region has been experiencing robust growth due to the increasing consumption of functional foods and dietary supplements. The higher economic power among consumers in the region has led to an increase in the consumption of soy protein, which is cheap and abundant in these countries. Countries such as Japan, Australia, and New Zealand are focusing on offering premium functional proteins ingredients, considering the derived health benefits. The major factors driving the Asia Pacific functional proteins market are the changing lifestyles of consumers, the rapid growth of the middle-class population, and the increasing consumer awareness about health & fitness. Also, investments and expansions in the region have driven the growth of the Asia Pacific functional proteins market. The challenges faced by pet food ingredient manufacturers include critical formulation and low consumer awareness. Such challenges may hamper the functional proteins market in the coming years. Key participants in the functional proteins market are the functional proteins manufacturers, suppliers, and regulatory bodies. The key players that are profiled in the report include Archer Daniels Midland Company (US), Koninklijke DSM N.V. (Netherlands), Cargill, Incorporated (US), BASF SE (Germany), Ingredion Incorporated (US), Roquette Frères (France), SunOpta (Canada), Darling Ingredients Inc. (US), Omega Protein Corporation (US), DowDuPont Inc. (US), Kemin Industries, Inc. (US), InVivo (France), and John Pointon & Sons Ltd. (UK). Figure 46 Strength & Weakness: Koninklijke DSM N.V.